Schist (pronounced /ʃɪst/ SHIST) is a medium-grade metamorphic rock. Schist has medium to large, flat, sheet-like grains in a preferred orientation (nearby grains are roughly parallel). It is defined by having more than 50% platy and elongated minerals (such as micas or talc), often finely interleaved with quartz and feldspar. These lamellar (flat, planar) minerals include micas, chlorite, talc, hornblende, graphite, and others. Quartz often occurs in drawn-out grains to such an extent that a particular form called quartz schist is produced. 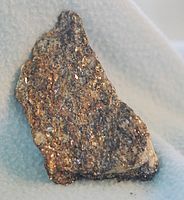 Schist is often garnetiferous. Schist forms at a higher temperature and has larger grains than phyllite. Geological foliation (metamorphic arrangement in layers) with medium to large grained flakes in a preferred sheetlike orientation is called schistosity. The names of various schists are derived from their mineral constituents. For example, schists primarily composed of biotite and muscovite are called mica schists. Most schists are mica schists, but graphite and chlorite schists are also common. Schists are also named for their prominent or perhaps unusual mineral constituents, as in the case of garnet schist, tourmaline schist, and glaucophane schist. Before the mid-18th century, the terms slate, shale and schist were not sharply differentiated by those involved with mining. During metamorphism, rocks which were originally sedimentary, igneous or metamorphic are converted into schists and gneisses. If the composition of the rocks was originally similar, they may be very difficult to distinguish from one another if the metamorphism has been great. A quartz-porphyry, for example, and a fine grained feldspathic sandstone, may both be converted into a grey or pink mica-schist. Usually, however, it is possible to distinguish between sedimentary and igneous schists and gneisses. If, for example, the whole district occupied by these rocks has traces of bedding, clastic structure, or unconformability, then it may be a sign that the original rock was sedimentary. In other cases intrusive junctions, chilled edges, contact alteration or porphyritic structure may prove that in its original condition a metamorphic gneiss was an igneous rock. The last appeal is often to the chemistry, for there are certain rock types which occur only as sediments, while others are found only among igneous masses, and however advanced the metamorphism may be, it rarely modifies the chemical composition of the mass very greatly. Such rocks as limestones, dolomites, quartzites and aluminous shales have very definite chemical characteristics which distinguish them even when completely recrystallized. The schists are classified principally according to the minerals they consist of and on their chemical composition. For example, many metamorphic limestones, marbles, and calc-schists, with crystalline dolomites, contain silicate minerals such as mica, tremolite, diopside, scapolite, quartz and feldspar. They are derived from calcareous sediments of different degrees of purity. Another group is rich in quartz (quartzites, quartz schists and quartzose gneisses), with variable amounts of white and black mica, garnet, feldspar, zoisite and hornblende. These were once sandstones and arenaceous rocks. The graphitic schists may readily be believed to represent sediments once containing coal or plant remains; there are also schistose ironstones (hematite-schists), but metamorphic beds of salt or gypsum are exceedingly uncommon. Among schists of igneous origin there are the silky calc-schists, the foliated serpentines (once ultramafic masses rich in olivine), and the white mica-schists, porphyroids and banded halleflintas, which have been derived from rhyolites, quartz-porphyries and felsic tuffs. The majority of mica-schists, however, are altered claystones and shales, and pass into the normal sedimentary rocks through various types of phyllite and mica-slates. They are among the most common metamorphic rocks; some of them are graphitic and others calcareous. The diversity in appearance and composition is very great, but they form a well-defined group not difficult to recognize, from the abundance of black and white micas and their thin, foliated, schistose character. A subgroup is the andalusite-, staurolite-, kyanite- and sillimanite-schists which usually make their appearance in the vicinity of gneissose granites, and have presumably been affected by contact metamorphism. In geotechnical engineering a schistosity plane often forms a discontinuity that may have a large influence on the mechanical behavior (strength, deformation, etc.) of rock masses in, for example, tunnel, foundation, or slope construction. ^ a b "Schist definition". Dictionary of Geology. Retrieved 2013-07-12. ^ Jackson J.A., Mehl J.P. & Neuendorf K.K.E. (2005). Glossary of Geology. Springer. p. 577. ISBN 9780922152766. ^ Bishop A.C., Woolley A.R. & Hamilton W.R. (1999). Cambridge Guide to Minerals, Rocks and Fossils. Cambridge University Press. p. 153. ISBN 9780521778817. ^ J., Tarbuck, Edward (2012). Earth science. Lutgens, Frederick K. (13th ed.). Upper Saddle River, N.J.: Prentice Hall/Pearson. ISBN 0321688503. OCLC 693684089. ^ "Schist". English Dictionary. Oxford University Press. Retrieved 10 February 2014. ^ R. W. Raymond, Slate, A Glossary of Mining and Metallurigical Terms, American Institute of Mining Engineers, 1881, p. 78. One or more of the preceding sentences incorporates text from a publication now in the public domain: Flett, John Smith (1911). "Petrology" . In Chisholm, Hugh (ed.). Encyclopædia Britannica. 21 (11th ed.). Cambridge University Press. p. 333. 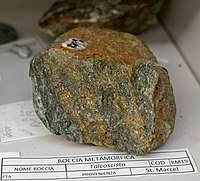 Wikimedia Commons has media related to Schist.